Researchers noted the participants' main source of protein was red meat, which has been linked to heart disease and bowel cancer. One rasher of bacon typically weighs 31g (1oz). Therefore a person would have to eat just under six-and-a-half rashers to take them up to 200g. A sausage is usually around 66g (2.3oz) and a slice of ham 20g (0.7oz). We would therefore have to eat three sausages and ten ham slices to take our intake to 200g. The findings, by Finnish researchers, add further fuel to the ongoing row about red meat and whether it is healthy. The research was carried out by the University of Eastern Finland and led by Heli Virtanen, a registered dietitian. The UK's Department of Health recommends people eat no more than 70g (2.4oz) of red or processed meat a day. And the American Institute of Cancer Research advises a maximum of 510g (18oz) a week, which works out at around 72g (2.5oz) a day. Red meat is higher in saturated fat than chicken or turkey, which can raise levels of cholesterol, known to lead to heart disease. DOES RED MEAT INCREASE OUR RISK OF BOWEL CANCER? 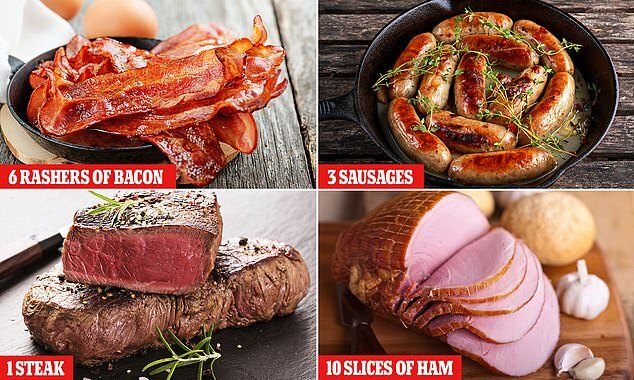 And the NHS states red and processed meat - which include sausages, bacon and ham - 'probably increases your risk of bowel cancer'. But the health service also praises red meat for being high in protein, iron and vitamin B12. To uncover the long-term effects meat really has on our health, the researchers analysed 2,641 Finnish men. The men - who were aged between 42 and 60 at the start - recorded their protein intake over a typical four-day period. They were then followed for an average of 22 years, during which time 1,225 disease-related deaths occurred. The study revealed those with a 'high animal protein' consumption relative to their plant-based intake were significantly more likely to die too soon. However, this was only true for those eating excessive amounts of meat, with fish, dairy and eggs posing no risk. Overindulging in meat was found to be particularly dangerous for those with type 2 diabetes, cardiovascular conditions or cancer. The results, published in The American Journal of Clinical Nutrition, remained true even after the researchers adjusted for other lifestyle factors. Future studies should look at how protein specifically affects people with health problems, the scientists claim. 'However, these findings should not be generalised to older people who are at a greater risk of malnutrition and whose intake of protein often remains below the recommended amount,' Ms Virtanen said.